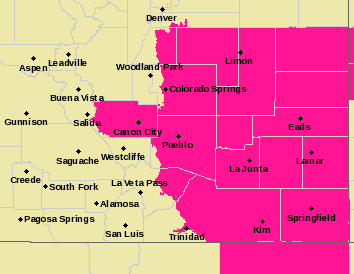 Fire danger Monday will be elevated across Colorado's eastern plains as temperatures rise to the upper 70s and even areas of 80s. Highs are likely to break records - which were set 19 years ago - by several degrees in Colorado Springs and Pueblo. Throughout the Arkansas Valley, including Pueblo, La Junta and Lamar, temperatures are expected to reach the low 80s. Eads and Limon can expect upper 70s. Combined with dry conditions and gusty winds, the risk of rapidly-spreading fires has lead the National Weather Service to issue a red flag warning from 11:00 a.m. to 6:00 p.m. Monday for most of the southeast quadrant of the state. Winds out of the southwest will gust up to 35 miles per hour and humidity is expected to fall to as low as 10 percent. 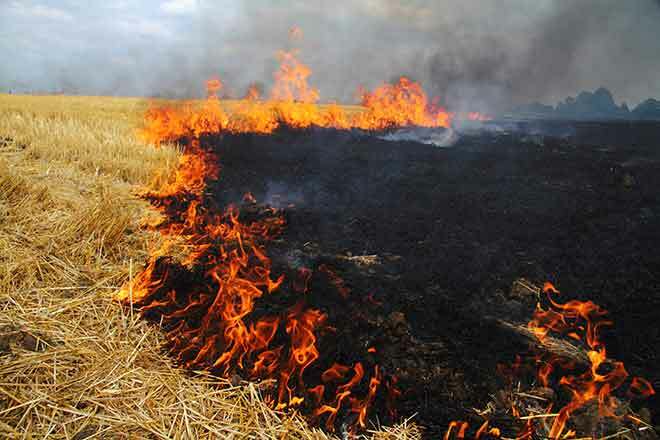 If fires do start, extreme fire behavior can be expected. The weather service advises avoiding all open burning and other activities that could spark a fire. Conditions will cool significantly Tuesday following a cold front pushing into the area Monday night. Highs will be as much as 30 degrees cooler than Monday. Weather conditions updated throughout the day can be found at http://KiowaCountyPress.net/weather.